A brilliant little pdf guidebook to the quarry can be had for free at the above link. Good topos and maps describe the climbing destinations between Kochel and Kampenwand, which offer routes ranging in length from single to 8-pitches and difficulties from 5.3 to 5.13. Not only are Alpine classics in perfect rock described here, but also modern alpine sport climbing and kid-friendly crags. Many alpine destinations around Wetterstein mixed in with some consumer-friendly sport crags. Climbing guidebook for the Bavarian Alps, Out of Rosenheim & Kufstein. Sport climbing in den Bavarian Alps. A mini-guidebook just for Stetten. climbing between Inn and Saalach. In English! In general, route development in the Pfalz has slowed, so while you can certainly get this brand new guidebook with up-to-date routes, an older guidebook would also suffice. Up-to-date guidebook for climbing in Odenwald. This out-of-print guidebook is to be replaced in the 3rd quarter of 2016. The bouldering guidebook to Thüringen. At the moment sold out, but a new one is coming. A facsimile of a previous guidebook which has since gone out of print. This one, too, is going out of print, so get it fast if you want one. It's written by Bernd Arnold and describes the best routes in Elbsandstein. A great general guidebook to the area. The climbing guidebook for the Bohemian Switzerland area of Elbsandstein. Your general go-to book for climbing in Elbsandstein. If you're just visiting and don't want to stay in one small area, this would be a good one to get for a general overview of the whole Elbsandstein area. However, depicted climbs are in the Sächs. scale of 6 and above. Thus, if you're a beginner or uncomfortable with climbing here, this guidebook might not be too useful. Out of print guidebook for the Vogtland. 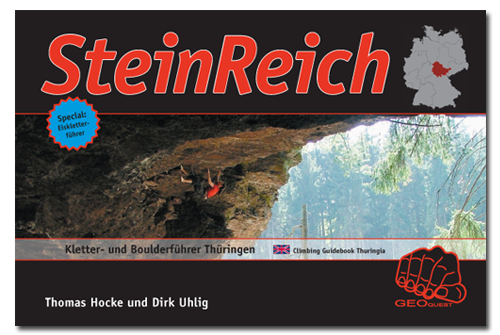 The bouldering guidebook for the areas around Chemnitz. All you need to know about climbing in the Erzgebirge. Though most of this book depicts climbing in the Elbsandstein area, some of the climbing is also found in Erzgebirge. It details the locations where you can find sport climbing and bouldering. A unique kind of guidebook providing buildering locations in the areas of Mainz and Wiesbaden. The guidebook is out of print. 208 pages in German about climbing in the Taunus and around Frankfurt. Published in 2009, this edition of the climbing guidebook for the Ruhrgebiet features 190 pages of maps, pictures, and descriptions of 40 different climbing spots. Among these are climbing gyms, artificial walls, natural rock and quarries. A must for crack climber! 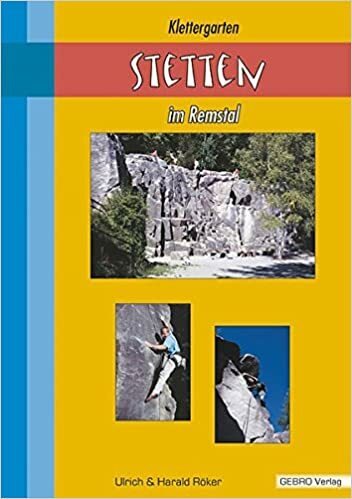 Bouldering and Buildering guidebook for central Germany. In both English (though limited) and German, this very modern guidebook details the climbing throughout the Halle / Leipzig area. Two guidebooks which divide the Harz into two halves. In total, they're about 300 pages and €40+. An excellent guidebook, completely in color, which describes 26 main areas (of which Ith is one) in its 500 pages. A guidebook for climbing in the city of Berlin and state of Brandenburg. This is the only guidebook for the region. Fortunately, it's also a very good one! Well-researched and with good descriptions, this guidebook leaves almost nothing to be desired. An excellent guide composed and written by local Jürgen Schmeißer, providing detailed information and topos for all areas, formations and crags in the Zittau Mountains (Zittauer Gebirge). Last but not least is this small and abridged guidebook from Sebastian Schwertner, written for extreme climbers. This guidebook details, in English, the places you'll want to go in the northern Frankenjura if you warm up on 5.11. It is definitely written for the visiting climber and is therefore probably the best guidebook for the area for those of you thinking of coming for a visit. If you're interested in buying it beforehand you can get it at the given link, or I'll sell you my copy for 5 and you can pick it up from me when you get here. To clarify, the book provides directions and descriptions for hard crags, which also often contain easier routes. So it's not exclusively for hard climbs. If you want it all in one volume, this is it. Though it was written in 2010, you've still got a lifetime's worth of routes here and don't need to fork out the 60 to get the brand new Schwertner guidebooks. The organization of this book is a little different from the rest as it doesn't need to divide the Frankenjura into two sections. Also, the book, as are the Schwertner books, is written entirely in German. These are the only guidebooks which provide descriptions in English. Parts 1 and 2 are laid out very similarly to the corresponding "Band 1" and "Band 2" written by Sebastian Schwertner, however the topos are more 3 dimensional. These are also not as up to date as the Schwertner guidebooks. This newest release from Sebastian Schwertner covers the southern areas of the northern Frankenjura. The areas described are: Walberla, Trubachtal, Betzensteiner Gebiet, Spieser Gebiet, Schnaittacher Gebiet, Pegnitztal, Krottenseer Forst, Hirschbachtal, Königsteiner Gebiet, Lehental, Högenbachtal, Förrenbachtal and Lauterbachtal. Unfortunately, the "areas" described here do not directly correspond to those here on MP. They are more generalized, whereas those here on MP tend to go parking parking lot, and then into further detail of which crags are accessed from these parking lots. This is the newest release from Sebastian Schwertner covering the northern half of the northern Frankenjura. The described areas are: Leinleitertal, Wiesenttal, Gößweinstein, Püttlachtal, Weihersbachtal, Klumpertal, Ailsbachtal, Paradiestal, Kaiserbachtal, Scheßlitzer Gebiete, Staffelberg, Kleinziegenfelder Tal, Bärental and Zillertal. Unfortunately, these "areas" don't have any correspondence with those included here on MP. This is an overview book that sets out to list every single crag on the European continent a la Tim Toula's "Rock N' Road". Intended for a broad audience of various languages, the book uses an absurdly complex assortment of symbols & numbers to "describe" each crag without the use of text. The book is in full color, with plentiful glossy photos of various crags. This isn't a guidebook in the classic sense, but it can be a good way to learn about the locations & raw statistics of the multitude of little known crags in Europe. The book indicates number of routes, height of cliff, length of approach, sun exposure, and relative quality for more than 2600 sport, bouldering & alpine crags. The book also points you in the direction of the pertinent local guidebooks. Its a nice reference book, but probably not too useful once you're on the road. Set it on the coffee table or near your procelain throne for a few minutes of inspiration when the local weather is bad. Rock Climbing Europe is the perfect starting point for Americans on their way to Europe. The book is far from comprehensive, so ensure that your destination is included before laying out $40 or so. If your destination is included, expect explicit, robust, American-style route descriptions (a rarity in European guides) & photo-topos, all prefaced with a good deal of "Lonely Planet"-style traveler information. The book also follows the Falcon Guide system of providing tips on lodging/camping and where to find amenities in the local area. The book is encyclopedic is size, so you may want to xerox the key sections if you're going for a short trip.